Students and educators flocked to the Student Activities Center on Wednesday for a vast symposium of research in programs ranging from Writing and Rhetoric to Physics and Astronomy giving presentations. Undergraduate Research and Creative Activities (URECA) offers programs throughout the year in subjects like STEM research to encourage student research and creative activities. It hosts the annual symposium for students to present their work. Over 200 booths were set up in Ballroom A with poster boards and, in some cases, physical examples from student projects. 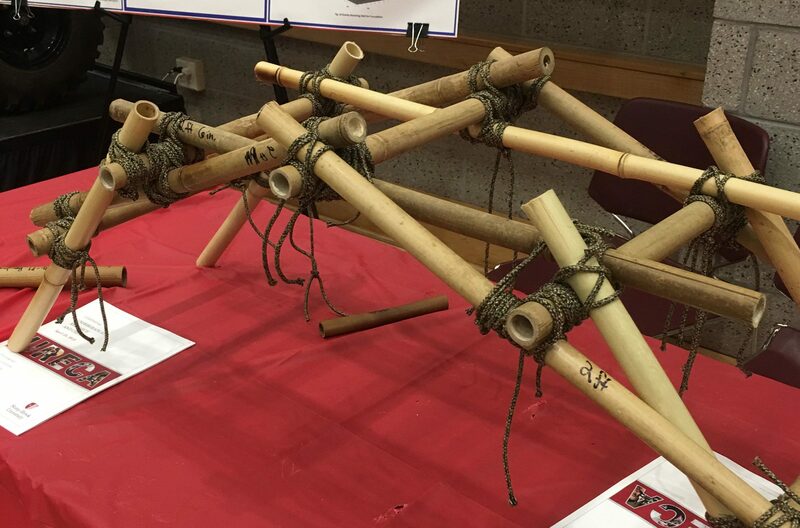 A small model of a bridge made of bamboo was set up at one booth. The presenter, senior civil engineering major Johnny Donza, explained that he was going to help build a similar bridge, on a larger scale, in Madagascar this summer. The bamboo design is meant to take advantage of plentiful bamboo on the island, where deforestation makes other types of wood more scarce. Another presentation focused on human and animal traffic through Ashley Schiff Park Preserve, a 26-acre woodland set aside on Stony Brook campus. Cameras on trees track activity, and student researchers compiled information from this year and last year to draw comparisons for the organization Friends of the Ashley Schiff Preserve. Nora Besendorfer, a high school science teacher from St. John the Baptist Diocesan High School, was at the event with 19 students from a science research program at her school. She admired the variety of research being presented.